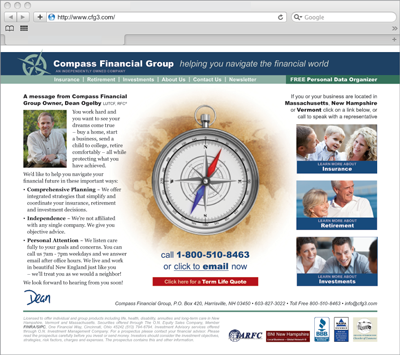 The Compass Financial Group (CFG) has three divisions: insurance, investment, and retirement. Owner R. Dean Ogelby approached Peter Harris Creative (PHC) to work on his firm’s website. Dean’s goals were to increase awareness and attract new clients. He also wanted to prepare for pending regulatory changes in the industry. Peter invited Dean to join him in developing a creative brief to: 1) provide a situation summary including a clear definition of the project; 2) specify who is on the team and who is responsible for what; 3) detail goals and benchmarks; 4) identify target customers, competitors, and other significant parties; 5) describe assets (information and materials to be provided) and deliverables (information and materials to be developed); and 6) lay down a schedule and a budget. One of the great benefits of a brief is that it help get everyone on the same page and keep them there. Almost immediately Dean began to see opportunities unfold before his eyes. He realized his firm’s website could be restructured to more effectively present information about products and services. A revised site could make it easier for prospects to get the information they need and to connect with a sales person. Less informed prospects could be educated and seasoned prospects could cut to the chase. And, it was agreed, a better looking site would attract and retain people’s interest. The team, once assembled, consisted of Dean, Peter, a copy writer and a local internet service provider who could code, optimize, and host the site. After further discussion about user experience, search engine, optimization and other factors relating to functionality, a site map was prepared. Concept were presented and approved. Copy was written. Static art was developed and, after careful review, coded. Working with Peter was easy. I appreciated his marketing expertise in designing my company website. His professional ability to know what would attract a person’s attention was invaluable. He helped me focus on who my target market is and what message I need to convey regarding my products and services. I was thoroughly satisfied with Peter’s ability to take all the aspects of my company and incorporate them into a clear and attractive website.